Taipei Zoo, with its 100th anniversary logo, has a long history. It is Taiwan’s only century-old zoo. It not only allowing the general public to experience nature, providing suitable environments for wildlife, but also accompanied by the many precious memories of Taipei’s citizens. Whether you’ve already been here on a school field trip, a date or with family in the joyous moments of the century-old park or not, the zoo workers, colleagues and animal friends always welcome everyone to visit the Taipei Zoo, and discover new feelings during each visit! During the Taipei Zoo’s 2014 centennial memorial, “Learning from Life” is the theme for representing the elegance of this generation. The centennial logo includes twelve different kinds of animals, symbolizing the importance of biodiversity. Moreover, a picture of pangolin is composed of these logos of twelve animals, representing Taiwan’s wildlife-research and animal conservation. Come visit and see this special logo, can you point out the animals that represent the achievement of Taipei Zoo’s conservation mission? 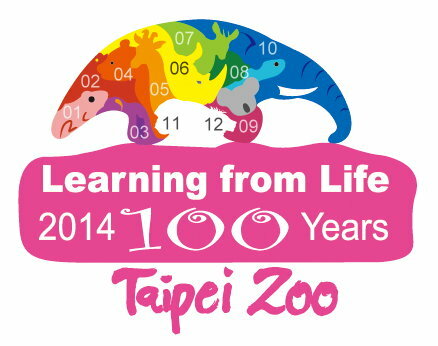 The logo of 100th anniversary of Taipei Zoo comprises different pictures of 12 animals, including the Pangolin.